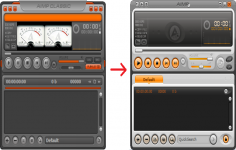 AIMP is an audio player that can play a variety of formats, avoiding passing a reader to another. 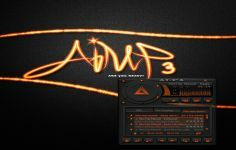 AIMP is a simple to use audio player that lets user listen to the tunes with impeccable quality. Being a complete and fully customizable player, AIMP supports a variety of formats including MP1, MP2, MP3, MPC, MP +, AAC, AC3, OGG, FLAC, APE, WavPack, Speex, WAV, CDA, WMA, S3M, XM, MOD, IT, MO3, MTM, UMX - reading and recording of radio broadcast over the Internet. With a customizable interface using skins, it offers various modifiable keyboard shortcuts. AIMP includes several modules dedicated to converting files, editing tags, the recovery CD sleeves and organize the songs. The application has equalizer with fifteen types of preloaded settings, a playback fade between each installment, automatic extinguishing manager, a function of a fast recovery track, and a visualization module. Audio converter: new encoding mode - "single folder - single file". DSP-manager: an ability to remove silence longer than 0.5 seconds. DSP-manager: now you can specify different preamp values for the "on-the-fly analysis" or "value from tags" modes. Default skin: an ability to customize text size for lyrics box. General: the %today() macro has been added. Lyrics: support for lyrics that embedded to CUE sheet. Music LIbrary: table - an ability to specify action by double click on table items. Music library: core - performance of DB engine has been improved. Music library: table - cards in group details view mode are now groups by value of first displaying field. Plugins: new built-in visualization called "album art" has been added. Plugins: compatibility with plugins from v2.60 has been improved. Tag editor: an ability to start autonumeration from specified index. Tag editor: support for the "delete word left/right from cursor" commands in text boxes. Tag editor: the %random() macro now can be used without argument, in this case maximal value will be equal to number of files to process. Tag editor: the %random(a) macro has been added. Fixed: AudioConverter - calculation of total progress does not take files duration into account. Fixed: AudioConverter - stat does not take all parts of the output file into account, if it has been divided into several physical files during conversion. Fixed: AudioConverter - the "remove sources on successful conversion" does not work with audio files that split by CUE sheet. Fixed: audio converter - tracks are skipped in some cases if the "one folder to one file" mode is used. Fixed: common - UTF-8 detection algorithm works incorrectly on windows with chinese locale. Fixed: common - app cannot be minimized to taskbar if app's taskbar button hidden via app settings. Fixed: general - control's images in dialogs displays too small if app is running on monitor with scale factor more or equal to 200%. Fixed: lyrics - LRC - value of the "offset" tag processes incorrectly. Fixed: lyrics - the "find in internet" option does not work with non-local files. Fixed: music library - apps hangs on invoke context menu with custom labels at first time if one or more DB operations are active in background. Fixed: music library - canceling background task may leads to hangs the app. Fixed: music library - grouping / filtering works incorrectly with the "copyrights" field. Fixed: music library - grouping tree - quick search value specified in one data source affects to other. Fixed: music library - grouping tree preset editor - default sorting value is displayed incorrectly. Fixed: music library - scrollbar position of table resets on delete files from table. Fixed: music library - the "disk was not found" error occurs on app startup, if paths with unknown drives are in the list for monitor while running. Fixed: player - apps hangs during internet radio playback if the "skip silence" option is switched on. Fixed: player - replay gain - preamp for values from tags affects to default replay gain value. Fixed: player - the "restore playback position for each playlist" works incorrectly in some cases. Fixed: playlist - auto-generated name cannot be put as user defined name. Fixed: playlist - auto-name generates based on first file only in some cases. Fixed: playlist - click at group header selects all tracks in group including tracks that have been hidden by quick search filter. Fixed: plugins - API - the IAIMPServiceFileTagEditor service cannot be used from non-main thread. Fixed: plugins - InputFFmpeg - memory leaks occurs during playback of files that contains multiple streams. Fixed: plugins - inputFFmpeg - bitrate for files in OPUS file format was not displayed (regression). Fixed: plugins - inputFFmpeg - displays total bitrate of file instead bitrate of audio stream. Fixed: plugins - last.fm - invoking the dialog with track information on app startup leads to hangs the app. Fixed: skin engine - TASETextDisplayEx - auto size works incorrectly if the alignment property is set value different from taLeftJustify. Fixed: skin engine - small issues have been fixed. Fixed: skin engine - text scaling works incorrectly for skins that does not support for high dpi on system with dpi that differs from 96 dpi. Fixed: skin engine - values that accessible from scripts does not take current scale factor into account. Fixed: tag editor - the album art field does not read from files in OPUS file format. Fixed: tag editor - unexpected behavior on jumping to next track in the list, if the list has been sorted by tag field that was changed during editing. Fixed: tags - ID3v2 - data from the USLT tag field is interpreted incorrectly in some cases.